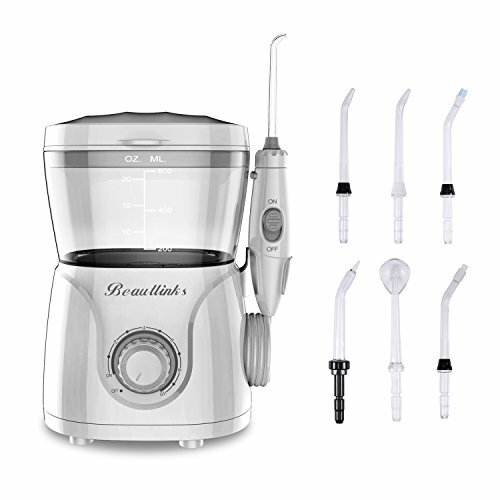 Large Capacity Tank-- Come with large 600ml tank, our dental water flosser can extend your flossing time to 180s. 360 Degree Rotated Nozzle-- The design of our oral irrigator can help you clean 360 degrees without dead angle. It It is suitable for all areas of mouth. Smart Design-- 7 flosser tips, Seamlessly Connect 10 pressure settings for gentle to maximum cleaning. 3 Minutes Smart Timer, our water flosser will help you to clean teeth more efficient. Quiet And Waterproof Design-- IPX7 waterproof design. Our water flosser can give you a quiet tooth cleaning environment. Easy To Use-- Mix a little mouth wash in with warm water, turn on the power button and the switch on the wand, you will feel your mouth clean and fresh after using. It comes with the main unit, 3 standard nozzle (6 replacement nozzles total) a tongue scraper, a pocket tip, an orthodontic tip and s lighted mouth mirror. This is worth every penny.